The Son-Rise Program, developed by the Autism Treatment Center of America®, is an alternative treatment program that breaks all the rules. Our program shows how joining children in their own unique worlds before asking them to join us in ours makes it possible for these special children to reach new heights! The Son-Rise Program, developed by the Autism Treatment Center of America®, is an alternative treatment program that breaks all the rules. Our program shows how joining children in their own unique worlds before asking them to join us in ours makes it possible for these special children to reach new heights! Since 1974, we have taught our unique and effective approach to help over 35,000 families worldwide. Learn to speak for the first time, or if the child is verbal, engage in natural, reciprocal conversations. Develop deep and meaningful relationships, no matter how disconnected they were at the start. Reduce and eliminate tantrums, aggression and other challenging behaviors. Experience real happiness, satisfaction, and love. Live a full life that includes making close friends, college, dates, sports, and jobs. This is a buildable course so you’ll start at module 1 and end at module 30. 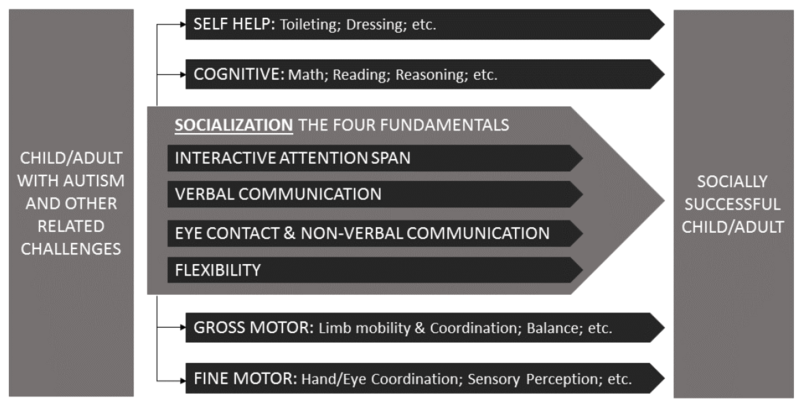 The Son-Rise Program® Developmental Model helps you to plot your child and set goals in Four Fundamentals of Socialization: Interactive Attention Span, Eye Contact & Non-Verbal Communication, Verbal Communication, and Flexibility. In each of these areas, you will be able to track your child through the five stages of development. Once you register you will be invited to join a group with other parents and professionals that are also participating in the Son-Rise Program Online. This group is moderated by Senior Son-Rise Program teachers who will be there to answer questions as you move through the course. 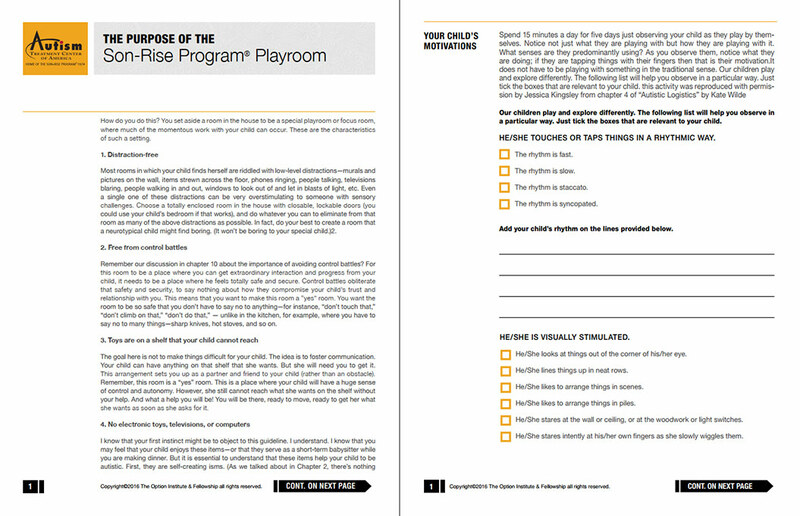 You will also have access to The Son-Rise Program Online content library which provides bi-weekly doses of inspiration, activities and tips to work with your child. If you’d like to take your support level a step further, you also have the opportunity to 50-minute support consultations (for an extra fee) with our Son-Rise Program Teachers in which they can provide strategies specific to your child. Learn from our Son-Rise Program Teachers as they highlight different techniques and how to use them in video demonstrations with children that we’ve actually worked with. "My son Jack would spend most of his time crying, so frustrated that he couldn’t communicate his feelings. I saw changes immediately when I started The Son-Rise Program®. He started to say new words, his eye contact improved immensely and he started to share an interest in the world around him. I feel with the expert training I have received, I have grown so much. My whole outlook on life has changed. I am a much stronger person than I have ever been. My one regret is that I didn’t start The Son-Rise Program sooner." "When he was diagnosed with PDD/NOS, the doctors told us there was little we could do for him. But, we did not believe that and went to attend The Son-Rise Program. Today, our son is back in a regular class and doing very well! He is performing at normal standards for his age both intellectually and socially. He is a very social, happy human being who taught himself to read and write! Because of his progress, we have been able to end our Son-Rise Program. Our child psychiatrist recently said that his progress is so phenomenal that he could no longer give him any diagnosis at all! Our lives have become so much richer thanks to The Son-Rise Program." "My son is 23 and we’ve been doing The Son-Rise Program for 9 months. The last 2 weeks have been amazing. He is spontaneously kissing and cuddling me for the first time since he was 4-years-old. He has picked up pens and is coloring for the first time ever. He is making his own choices without being asked. NEVER GIVE UP NO MATTER HOW OLD YOUR CHILD IS - just believe in them." "My 16-year-old son and family were in a crisis when we first heard about The Son-Rise Program. He displayed symptoms of Autism and was having numerous seizures, becoming aggressive at school, and was very unhappy. Fourteen months later, with the benefit of the parent-training program taught at the Autism Treatment Center of America, Tyler is so happy. His conversation skills have developed incredibly, his seizures have been reduced from every 5 days, to as long as 6 weeks apart! He gives spontaneous hugs, talks about his feelings, has developed a great imagination, and is more comfortable in groups and new situations. We are so thankful to have found a way to help Tyler." 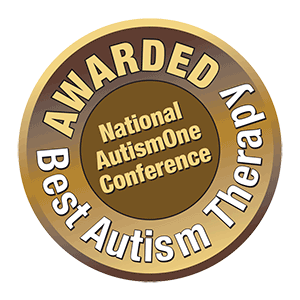 "Before the Autism Treatment Center of America®, I was frustrated beyond belief. Everyone would offer a speedy diagnosis along with a grim prognosis, but NO HELP! No information on how to help my child and being told it was out of our hands. The Son-Rise Program was like a road back home. I know my child better than any professional— The Son-Rise Program let me use my power to reach my son and be awed by him. He's already doing things 6 months into the program that were deemed impossible." We support your hopes and dreams for your child, and now you can learn to apply and implement the program's techniques without ever leaving your home. The Son‑Rise Program Online is: Fun!, Interactive!, and Engaging! You have a love for your treasured son or daughter that is everlasting. If you're still nurturing a hope that a wonderful and fulfilling future is possible for your child… it is. And it starts here. Copyright © 2018 by The Option Institute & Fellowship. All rights reserved. A division of The Option Institute. A non‑profit, federally tax‑exempt, charitable organization.